New update forcing Cortana and Bing on millions! Not wishing to post comments on other authors' articles and having just read Daniel's excellent article about the Anniversary update, I'm peeved to say the very least. One of the very first things I've done on all my Windows 10 installs (all four of them) was to disable Cortana, set search to local and set the default search engine and browser to one of MY choosing. Actually, I'm not just peeved, I'm seething. It's the principle of the matter. When I search and let's face it, we search a lot on our PCs, I want to do it locally and without being spied upon. 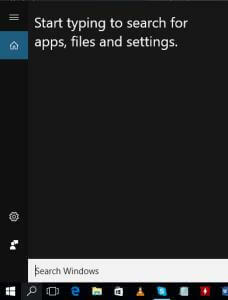 As I write this, I've just spotted that there is indeed a way to restore local search and to disable Cortana, through a very handy registry hack and deft use of the group policy editor. There's been a lot written about this but it's my understanding that it does not affect the default browser or search engine at all (normal searches online), only Cortana searches. The way I'm reading it - the user will no longer be able to turn Cortana off, eliminate web-based results from the Cortana search, or change Cortana's default search engine away from Bing. Anyone who doesn't use Cortana will not be affected. If I am wrong, I do apologize and will surely join the protest. I haven't been upgraded yet Jim so I can't be sure. Either way, i don't like it and as Daniel says, who uses Bing anyway? I have the defer upgrades checked on all of my PC's that is running W10 until I can get more info on the Anniversary update. Hopefully one of our DCT writers can shed some more light on this subject. The article by Daniel should not be ignored and makes one wonder just where MS is trying to take W10. Oddly enough I upgraded today, but not by choice. More by default. I downloaded the new upgrade via search for updates, but had rescheduled it through the windows update advanced options to install on 11th August thinking wrongly that a restart wouldn't upgrade me. It's all a question of interpretation really. Once the update is downloaded it needs a restart to install, so even if you need to restart for some other reason it's going to trigger the upgrade anyway, regardless of whether you want to wait a few days. As it happens, all is well and I haven't suffered the so called disasters that have been chronicled on the web by others and Cortana hasn't taken over my PC all HAL 9000 like; all is exactly the same as it was before. Precisely! As I suspected, another mountain out of a molehill. This will likely only affect mobile users, plus any desktop users who choose to utilize Cortana, which I'd imagine would be well in the minority. Microsoft is obviously keen on emulating Apple's success with Siri and, although I know little about the Apple ecosystem, I'm pretty sure Mac/iOS users would not be able to change Siri's default settings, including whatever search engine is used. I think it's a bit silly of MS to do away with the ability for desktop users to turn Cortana off all together but simply ignoring it will end up a very similar result. 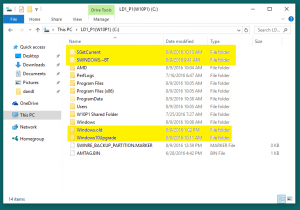 What can safely be deleted after the W10 Anniversary update install? Except for a few cosmetic changes I can see very little that has changed for my PC. Would like to clean up my C drive and delete the four folders that was created during the update. Run Disk Cleanup and after it loads choose "Clean up system files". This will allow you to remove the downloaded remnants of the upgrade under Windows Update Cleanup, Windows Update log files, Delivery optimization files, Temporary Windows installation files, and Previous Windows installations. 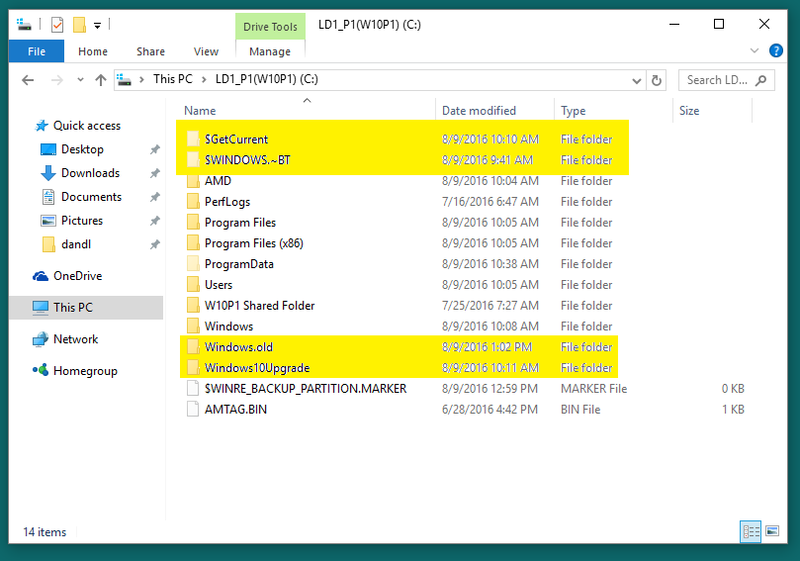 Got the $Windows BT folder and the Windows.old folder removed but the $GetCurrent and the Windows 10Upgrade folder are still in C Drive. Tried to Google for some info but no one seems to know anything. Try it again, but pay attention to your choices in the left column. If it mentions Windows, Update, rollback, etc check the box. OK Dave, I had to manually remove the $GetCurrent and the Windows 10Upgrade folders. I actually moved the folders to my data drive and then set a restore point and deleted the folders. I have since rebooted several times just to see if everything is running. Since Windows created a 450MB recovery partition when installing the Anniversary update, I can't see where these two folders contain any pertinent info, except for the update itself. Cortana can now be disabled very easily. Here is a link to a post that tells you how to do it. 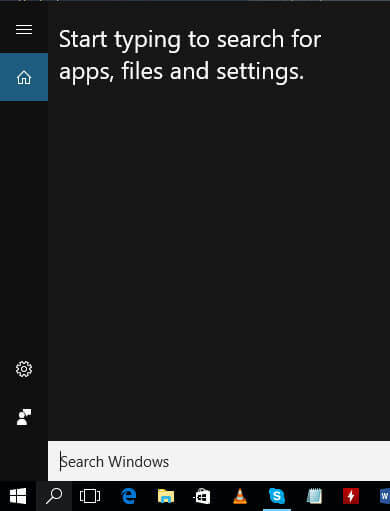 If I can follow the directions for disabling Cortana on my Windows 10 Pro 1803 version, anyone can.